My big brother celebrated his birthday yesterday and I got too sleepy to post anything last night. My brother has a special (crazy) love for animals. 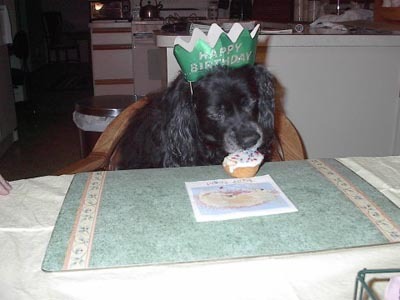 In the photo above, the family dog, Trekkie, celebrated his 14th birthday in grand style. After all these years, even Trekkie understands the tradition and happily cooperates for at least a few minutes. If you need your pet trained to celebrate their birthday, just call my brother…lol! Big Bro! Happy Birthday and Much Love! This entry was posted on Thursday, May 26th, 2005 at 10:51 am. It is filed under Family. You can follow any responses to this entry through the RSS 2.0 feed.